Mason Jameson of Frontenac is now ranked #1 in 145 and was MOW at Circle. All records come from Track Wrestling unless otherwise noted. For the third straight season, McPherson will host the unofficial state girls’ tournament on Saturday. Start time is 9 a.m. Girls’ wrestling continues to significantly grow and a large number of coaches, wrestlers, media and fans have supported the sport earning KSHSAA sanctioned status next year. The KSHSAA Board of Directors will vote in April on a proposal to sanction a high school girls’ tournament. According to numbers released from McPherson, the first state tournament had participants from 37 high schools. Last year, 55 schools represented. This winter, at least 71 squads are expected to participate, from Class 6A Wichita South to 1A Tribune-Greeley County. McPherson has enjoyed big seasons from multiple wrestlers, including nationally ranked Mya Kretzer, who has wrestled most of the season against boys. Kretzer is up to No. 9 nationally at 127 pounds in the latest Flo Wrestling rankings released Wednesday afternoon. Nickerson’s Nichole Moore, who is 33-7 against boys this season, is up two spots to eighth at 106. Moore has won multiple boys’ tournaments and was second at Circle last weekend. Paola sophomore Jordyn Knecht is No. 15 at 117. Fredonia senior Mason Claibourn is No. 14 at 152. Junction City junior Elisa Robinson moved from third to second at 180. As well, Haley Schafer leads the Bullpup girls with 20 victories, according to statistics released by the team. Kaleigh Marbut paces the squad with 18 falls and 26 takedowns, and Cat Palacios is first with eight reversals, and Arriana Gross has 12 escapes. In the final tuneup before state last week at the Wichita South tournament, Marbut finished second, Schafer was first, Morgan James was third, Sailor Peterson finished third, Holli Giddings took second and Madison Skytte was third. Many of the top girls from the Wichita South tournament are expected to be at the state meet. Other WS champions featured Wichita Southeast’s Eleanor Breen at 106 pounds, and Buhler’s Payton Warkentin at 113 pounds. Warkentin has enjoyed a strong year and won her finals match by technical fall, 18-1. In the 120/126 division, Andover Central’s Anja Tschohl won by fall against Marbut in 1:14. Great Bend’s Breanna Ridgeway captured the title at 132, Draziare Cameron of Wichita West won at 145, and Douglass’ Jewella Cokeley defeated Giddings, 7-0, for the title at 152/160. At 170/182, the state tournament could feature a very close bracket. Fort Scott’s Mersaide Roof won the bracket, but she, Great Bend’s Kyeal Mogbo and McPherson’s Madison Skytte all went 1-1 against each other. For many teams, especially high-level 3-2-1A squads, the Panther Classic represents the final major tournament before regionals in two weeks. The 16-team competition had an extremely close race with Minneapolis winning with 111 points. Abilene was second at 107, while Beloit and Norton tied for third with 104. Norton and Rossville tied for fifth at 102.5. Minneapolis has made one of the biggest jumps among any program from last season. The Lions were fifth at the 2018 Panther Classic with 78 points. Marysville captured the tournament last winter with 148.5 points, but didn’t compete in the tournament this year. The 3-2-1A standings remained the same in the top-5 with Colby, Eureka, Norton, Hoxie and Plainville. Unranked Adam Reed (20-14) took second at 113. Tristan Hauck (30-2) captured a title at 138 with four wins by fall in the first period and a 9-0 major decision victory versus Hill City’s Bryce Ashbaugh (23-9). He is still ranked second in 3-2-1A. Hauck’s four pins tied for second in the field and he had a cumulative fall time of just 3 minutes and 29 seconds. Overall, Minneapolis’ 16 pins led the field, one ahead of Abilene. The bonus points helped capture the title. At 182, Tyson Villalpando (22-0) remained undefeated with a fall in 1:17, a 17-5 major decision and a 9-4 win versus Norton’s Gavin Sproul. He stayed first in the classification. Last winter at the 195-pound bracket in the 3-2-1A state tournament, Brookville-Ell-Saline’s Nick Davenport beat Hayden Wiltfong by fall in the third/fourth place match. This season, Davenport/Wiltfong have been ranked 1-2 all year at either 195 or 220. They met up for the first time this season and Davenport defeated Wiltfong, 3-1, in the title. Davenport is 30-0, and Wiltfong dropped to 23-2. He has only lost to Newton’s Wyatt Hendrickson and Davenport, both undefeated wrestlers. In the semifinals, Davenport delivered another quality win versus Beloit’s Creighton Johnson, 3-0. Johnson is 24-7. Ell-Saline had just three wrestlers in the tournament and 285-pounder Noah Hopkins (14-16) was the only other placer with a sixth-place showing at 285. In the last week, Davenport has signed with Butler County and WIltfong with Fort Hays, both for football. Davenport and Wiltfong remained 1-2 in the classification. While Colby and Norton have more depth, Hoxie continues to be in the strong mix for a Class 3-2-1A state championship because of its elite talent and ability to win titles. At 120, freshman Drew Bell (28-5) took the championship with wins against Phillipsburg’s Aaron Lenker and Fredonia’s Hunter Reddick, although the Reddick match was an injury default. Currently, Bell is second, and Reddick stands fifth. At 132, Dylan Weimer (27-6) captured the championship with two falls in a combined 3:38 and a 7-1 decision. 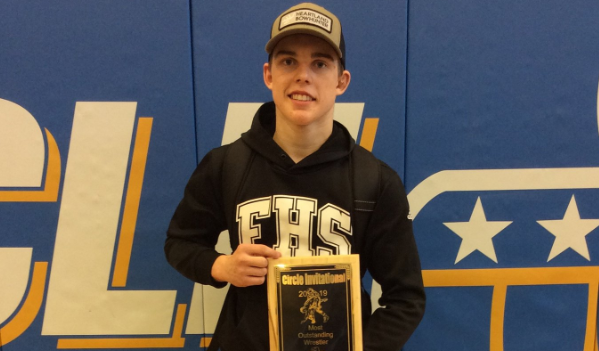 At 160, Dayton Porsch bounced back from his loss at the Garden City Rocky Welton Invitational – his first since his freshman year – and easily cruised through his bracket. Porsch (33-1) captured his three matches by three first-period falls, including in 1:17 against Norton’s Brandon Vacura (24-5) in the championship. Both Weimer and Porsch remained in the same spots – Weimer is sixth at 132, and Porsch is first at 160. Norton had no champions, but finished third at 106 with Darius Shields (26-9), third at 126 with Camdyn Unterseher (22-7), second with Gavin Sproul (20-14) at 182, and third at 195 with Judson Wiltfong (24-9) in addition to Hayden Wiltfong’s runner-up. Schields is still sixth at 106, Unterseher stayed fifth at 126 and Vacura retained his No. 5 spot at 160. Sproul and Judson Wiltfong are both unranked. Top-ranked senior 152-pounder Zane Colson, who competes for Rock Hills but co-ops with Beloit, improved to 27-0 with falls in 41 seconds, 60 seconds and 4:19. Beloit’s River Paul (23-6) has enjoyed a strong season and took second at 195 with a loss by fall in 1:57 to Rossville’s Kody Davoren (27-4). Davoren is ranked fourth at 195. Creighton Johnson (24-7) was fourth at 220. Will Stroda, who took third at state last season with a 43-3 record, has been ranked first at 4A 113 all winter. He is 34-3 after a highly dominant run through his four matches. He captured wins in 15 seconds, 38 seconds, 39 seconds and 2:14. Freshman Kaleb Stroda, who had been No. 6 in 4A, took second with a 12-3 finals loss against Zach Archer (27-4). Archer, a junior, is ranked second in 3-2-1A. At 160, Dakota Laun (27-12) finished third, and Dakotah Whiteley (26-4) was second at 170. Laun is unranked, and Whiteley is fourth in 4A. He fell in the finals by sudden victory, 3-1, against Oakley’s Morgan Rains, who is 26-3 and is ranked fourth in 3-2-1A. Abilene had a pair of third-place finishes with Colby Mohr (18-16 at 182) and Dawson Wuthnow (27-11 at 220). Additionally, Fredonia junior Matt Weilert, who has competed at 138 and 145 this year, earned the win at 145 with a fall in 5:38 against Lincoln junior Chantz Vath. Weilert is 25-6, and Vath is 29-3. Weilert is second at 145, and Vath bumped into the rankings at No. 6, one of the few 3-2-1A ranking changes this week. Cimarron won the nine-team Leoti Round Robin with 126 points, 17 ahead of Leoti-Wichita County and Lakin was third with 82 points. At 160, Tate Seabolt (26-2) captured a title with a 4-0 mark. He was dominant with his victories in 1:15, 46 seconds, 1:38 and 1:05. At 182, Dylan Newton (25-1) captured the crown and had just two matches, victories by fall in 3:34 and 1:32. Seabolt is fourth at 160, and Newton is fourth at 182, same spots as last week. The Bluejays received runner-up finishes from Adam McPhail at 126 and Alex McPhail at 132. Adam is 23-3, and Alex is 20-6. Adam captured three wins by fall in 3:15 or less and a 5-0 decision. Alex won by a 9-2 margin and then captured four victories by first period fall. Colby Johnson (7-13) also took second at 138, and Garet Walker (21-9) was second at 152. At 170, Kyler Henry (11-9) finished second. Lakin won four titles, including at 285 with Hadley Panzer (31-0) and earned Sports In Kansas American Implement Southwest Kansas team of the week. Panzer stayed second in 3-2-1A as the Broncs’ lone ranked wrestler. At 152, Jesse Gardner (23-1) went 5-0 with two wins by forfeit against teammates and wins in 1:34 and 14 seconds and a 5-3 decision. Gardner remained No. 5 in 3-2-1A. James Ricke (12-7) won the title at 126 with three wins by fall and a 3-2 decision. At 195, Blake Hernandez (10-5) captured the title with three wins by fall: 39 seconds, 2:23 and 3:09. Sabetha, with its elite talent, is looking to become the first 3-2-1A state wrestling champion from the east side of the state since Atchison County won in 2000 and ’01. Last week, the Bluejays went to the seven-team Fairbury (Neb.) Invite and took third with 104 points. Two Nebraska teams, Beatrice and Milford, were the top-two teams. At 285, Elliott Strahm (15-0) stayed perfect. Strahm, who continues to receive plenty of Division II football offers and PWO Division I offers, had just two matches and won by fall in eight seconds and 28 seconds. At 145, Kamden Brownlee (14-4) took second. He won by fall in 2:32, an 11-0 major decision and 38 seconds, along with a 6-2 loss in the championship. At 152, Colby Tinklin (12-5) won the title with falls in 2:56 and 2:27, a 3-2 decision and a 13-0 major decision. At 160, Walker Lowdermilk (14-4) earned the title with four wins by fall in 55 seconds, 1:59, 55 seconds and 2:41. At 220, Sabetha senior Cauy Rokey (9-1) has had few matches this season and went 4-0 at the tournament with a dominant run with falls in 39 seconds, 2:21, 48 seconds and 22 seconds. None of the Sabetha rankings changed this week. Strahm is first at 285, Rokey is third at 220, and Brownlee is fourth at 145. Scott Radke captured the title at Rose Hill and broke Travis Stites’ career takedown record and helped McPherson take third in the tournament that featured many top-10 squads. Derby won the 24-team tournament with 212 points, Bonner Springs had 173.5 and McPherson was third with 156.5 points. Chanute was fourth at 136.5. Salina Central took fifth at 119, Winfield was sixth at 112.5 and Andale was seventh at 99.5 with Burlington eighth at 96. Derby is first in 6A, Bonner Springs is fifth in 5A, McPherson is unranked in 5A, Chanute is second in 4A, and Salina Central is tenth in 5A. Burlington, Winfield and Andale are 6-8, respectively, in 4A. Radke (33-1) took the championship at 160 for McPherson with a win by fall and three victories by technical fall. He stayed second at 160. At 170, Jonah Clarke (29-7) finished third. Rhett Edmonson, ranked fourth at 138, did not compete for the Bullpups. At 182, Landon Frantz took third (26-7), Mason Thrash (26-8) is third at 195, and Kourtney Craig (23-13) is fourth at 220, and Alex Perkins (17-4) at third in 285. Perkins stayed sixth at 285. At 132, Xavier Sisco (4-2) entered the tournament 0-2 this year. He won four matches, his first four wins of the season. He won by fall in 5:21 and decisions with 4-0, 9-6 and 6-0. At 126, Bryce Wells (17-9) took second to Salina Central’s Drew Burgoon, who is 32-0 and ranked third in 5A. Burgoon won 8-2. Wells is still fourth in 6A. At 145, Cooper Ross (16-2) lost by injury default in the final against Andover Central’s Christian Hannon. Ross stayed third in 6A. At 170, Cade Lindsey (32-1) won the title with three wins by fall in 3:44 or less and a big 11-2 decision against Burlington’s Brett Bober (30-2). At 182, Derby’s Triston Wills (24-5) took second in a huge matchup against Winfield’s Owen Braungardt (30-3). Lindsey and Wills have both signed with Oklahoma State wrestling. Braungardt has been No. 1 in 4A at 182 and pinned Willis in 63 seconds. Wills has captured his first three wins in 24 seconds, 71 seconds and a technical fall. Braungardt won by fall in 1:22, by technical fall, and by fall in 5:41 before the championship. Lindsey is No. 1 in 6A, Wills is No. 1 in 6A, and Bober is second in 4A. In January at the Derby tournament, Braungardt also defeated Wills, 6-5. At 195, Bryce Westmoreland (24-7) took second. He lost in a big matchup versus Salina Central’s Taylon Peters (27-2) in a 9-0 major decision. Peters is second in 5A, and Westmoreland is fourth in 6A. At 152, Joe Tapia (30-6) captured the title with a 2-0 final against Burlington’s Cael Johnson (30-2). Tapia won by fall in 33 seconds, technical fall and then had two more falls. The Braves had a significant of top finishes, including third place from Derek Duffett at 106. Tapia is fourth at 152 in 5A, and Johnson is second at 152 in 4A. Duffett is third at 106. Cruz Lara (23-8) took second at 120, and Michael Daniels (26-4) was runner-up at 138. Jose Lopez was runner-up at 160 and moved to 20-9. Caleb Willis (29-3) took second at 220. Lopez is fourth at 160, and Willis is third at 220. The 4A rankings again went through big changes this week. Scott City is still No. 1, but now followed by Chanute, Marysville, Frontenac, Tonganoxie, Burlington, Winfield, Andale, Prairie View and Ottawa. Last week, it went Scott City, Winfield, Chanute, Marysville, Tonganoxie, Burlington, Rose Hill, Pratt, Prairie View and Abilene. The Blue Comets had another big showing with the lower weights with champions at 106 and 113 pounds. Trent Clements (30-5) took the title at 106 with a great, 4-3 decision versus Maize South’s Ian Demoss in the final. At 113, Kolton Misener (29-7) was the champion with a 5-0 decision against Jayhawk Linn’s Brody White in the final. White is 24-6. Clements is fourth at 106, and Misener is third at 113 in 4A. Parker Winder (37-5) collected the title at 138 with a 7-6 decision versus Bonner’s Daniels. At 132, Logan McDonald took second with a 6-0 loss to the surprising Sisco. He is 28-7. Winder is third at 138, and McDonald is fourth at 132. Frontenac’s large leap in the 4A rankings from unranked to fourth came with its big performance at Circle. The Raiders collected 209 points in the 26-team Circle tournament, well ahead of Eureka at second place with 153.5 points. Keith Akin and staff have built this program from the ground up that is in its ninth year. Riley McDaniel (30-0) continued to stay perfect at 138 and top-ranked in 4A. In the final, McDaniel defeated Eureka’s Brennan Lowe, 7-3, Lowe is No. 3 at 138 in 3-2-1A. At 152, Brendan Ishimura moved from sixth to fourth with a title and improved to 22-2. He won 13-4 against Eureka’s Brent Escareno, who is fourth in 3-2-1A. Will Jameson (18-2) also captured the title at 160 and moved from unranked to third. At 182, Kaleb Kroenke (21-12) is first. Eureka twins Kendall Beitz (32-1) and Kolby Beitz (29-3) continue to rank No. 1 in their respective weight classes. Kendall defeated Council Grove’s Tom VanValkenburg, 7-4. VanValkenburg is 30-3 and ranked fourth in 3-2-1A. Kolby Beitz went 4-0 with four wins by fall. Brennan Lowe (29-4) is second at 138, and Brent Escareno (33-5) took second at 152.